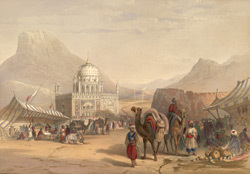 This lithograph was taken from plate 27 of 'Afghaunistan' by Lieutenant James Rattray. The tomb of Ahmad Shah Abdali was near the Bala-Hissar (Fort) of Kandahar. The founder of the Durrani monarchy, Ahmad Shah was revered by Afghans as their greatest monarch, combining military skill with a decisive character and the virtue of clemency. One of his most famous feats was the conquest of Delhi and the defeat of the Maratha forces in India at the Third Battle of Panipat in 1761. With India his for the taking, he withdrew, deciding against ruling a remote region. His decision was influenced by the fact that the Sikhs, whose star was in the ascendant, lay between him and Afghanistan, and that insurrection was rife at home in his absence. He died in 1773 and his tomb was a place of sanctity where all men received asylum, even if murderers and malefactors. No European was allowed in, but Rattray wrote of the charm of the "ensemble of the chaste, simple building, thrown out by the dark tints of the extraordinary Bullock's Hump mountain, rising in jagged outline behind it".